What is the recipe for a good gluten-free life? It likely includes: knowledge of gluten-free ingredients; skill at reading food labels; a little cooking experience; a dash of persistence; and a good helping of humor. 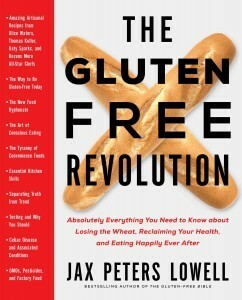 Author Jax Peters Lowell seems to have mastered this recipe for successfully living gluten free. Lowell, diagnosed with celiac disease in the early 1980s, published her first book about the gluten-free life, Against the Grain, in 1995. She says it was the kind of book she felt she needed when she was newly diagnosed. Two more books followed: the children’s book No More Cupcakes and Tummy Aches in 2004 and The Gluten-Free Bible in 2005. A published poet and novelist, Lowell has returned to the gluten-free theme with her newest book, The Gluten-Free Revolution. She says it is a resource for anyone who is gluten free. Filled with personal stories and humor, the book covers traveling, managing social situations, talking to doctors, working with restaurants and much more. Gluten-Free Living’s Amy Leger talked with Lowell about her early gluten-free years, the inspiration for her gluten-free writing, and why humor might actually be the best medicine. Amy Leger: You were diagnosed with celiac disease when very little was known about it. Tell us more about getting diagnosed. Jax Peters Lowell: My mother had a favorite picture of me as a toddler at the beach, and there I was with a chocolate mustache and a frown. She loved that picture of me in my little bathing suit, stick thin legs and soccer ball belly. I learned I had celiac disease many years after that photo was taken, and in the craziest way. I was having bone pain, serious bone pain. A doctor X-rayed me and asked, “So when did you fracture your wrist?” [I was unaware of having fractured my wrist and] I said, “I don’t think I would forget something like that.” God knows what he thought of me. Had I been dancing on the tables? No. The truth is, that was my first clue. I literally fractured my right wrist from lack of calcium absorption. After that I had brain fog and fatigue, and I stopped eating. I was 90 pounds. I was a human Q-Tip. Doctors at one time thought I had lymphoma. I realized all those years after that little baby picture that celiac disease is silent and pernicious. And when it finally let loose, I was ravaged by it. I finally got diagnosed, and it took me a very long time to get better. AL: How did you handle your diagnosis? But everybody loved me there. They gave us wine and cheese and glared at my husband if he even imagined ogling a tart. I just thought this is the way it has to be, that I could figure this out. I began to read anything I could—every scrap of material, every research paper I could find. I vowed never to be that sick again. AL: What led you to write your first book? JPL: I went to an early Celiac Sprue Association conference in Chicago. I didn’t know a soul who had celiac disease. I met the saddest, most marginalized, sickest and depressed people. I am by nature optimistic, and I have a good sense of humor. I was just glad I didn’t have lymphoma and didn’t have to take medicine. I remember one woman who drove with a trailer full of her food because she was afraid to eat anywhere. I didn’t think I had anything in common with these people. We were waiting outside the hall, and the minute those doors opened this aggressively hungry crowd just stormed the place. And I did, too. I realized I had the same ache [for good, safe food]. There were pies on the table. Probably the worst pies ever. But that dough and sticky fruit; that sweet burnt smell that made us feel normal. I thought, “These people need a voice. I need a voice.” That is when I began to think about writing Against the Grain. AL: How is The Gluten-Free Revolution different? AL: What do you think of the popularity of everything gluten free? JPL: These are great times with a great selection of food for people with celiac disease. But they are hard times in terms of getting information. When you inquire about food at a restaurant or about a grocery product, who are you asking if something is gluten free and how much do they know? Once I noticed a big pasta restaurant. I went in and asked, “Do you have gluten-free options here?” The employee’s face lit up and she said “Our gluten-free customers love the whole wheat pasta!” What if a new gluten-free eater had asked her that question? They might not have known any better and eaten the pasta. AL: How would you describe your gluten-free writing style? JPL: First, unlike a lot of people in the world of gluten-free writing, I am a novelist and poet. For me, story is very important. That is how we learn everything on any subject. I believe that food is the narrative that runs through our lives. So I tell stories in the book that are keenly pertinent to the subject of that particular chapter. Some of them are emotional. how you managed the diet early on versus what it is like for you today. JPL: My friends still talk about the apple crisp that I made long ago that tasted like dirt. Everything was made with brown rice. We didn’t have these wonderful, sophisticated blends of flours back then. In the beginning I had to sit down with the chef if we were going out. I would often go to the restaurant ahead of time to discuss the fact that I and 100 of my friends would like to come, and I needed to have a safe meal. I exaggerated the number so the chef would just listen to me. It was always a big negotiation. In comparison, I recently went to a fabulous restaurant in Philadelphia. I asked for polenta and the waiter said, “The dish is gluten free, but I must tell you we sourced the cornmeal from a facility that also uses wheat.” I was ready to swoon. I used to have to talk restaurant staff through everything … Eating is wonderful now. I recently had a gluten-free brioche roll swimming in a puddle of pumpkin butter, and I didn’t want to order the rest of the dinner. I just wanted to order three of those and go home. AL: Giving back to the gluten-free community is also important to you. JPL: When people are not well, they find me. It gives me great pleasure to help them. Every now and then my doctor will call and ask me to talk to a patient who is having trouble following the diet because they are missing their favorite foods. When I talk to them, most of the time people are surprised by what they can have and that pleases them. I do love helping a confused gluten-free shopper at a grocery store. I let them know, “This is not going to be bad at all.” I love doing that. AL: What is the weirdest gluten-free moment you have had? JPL: Weirdest or most stupid? Years before I knew better, I was trying to get my health back. Somebody told me that brewer’s yeast would help me a lot. So I took it. To my credit I hadn’t written my book yet. I ended up going back to my doctor because I was so sick. I said, “I’ve been taking brewer’s yeast to help with digestion.” He said “What? Why don’t you just sit down at a bar and drink a big glass of beer? It would taste better!” I was so embarrassed. I think everyone has one of those moments. AL: What are your two best tips for living gluten free? JPL: My No. 1 piece of advice: Don’t run around buying up everything gluten free. Start small. Gluten-free products are really expensive. Know how you like to eat. Get some pantry staples and buy them in small batches in case you don’t like them. If you don’t like something, don’t buy it again. Second clean out your kitchen. If you can, make it a gluten-safe or gluten-free kitchen. Replace contaminated foods and kitchen tools. If you have a combination kitchen, get a toaster oven [that you can keep from getting cross-contaminated]. Organize your refrigerator, and put the gluten-containing ingredients on the bottom to avoid cross-contamination. JPL: No, not any more. I think there are a lot of things in life that stink much more than celiac disease. The feeling-sorry-for-yourself part was a long time ago with me. I think that is the natural outgrowth of a diagnosis. If you don’t allow yourself the wallowing, if you suppress it, it will show up when you least expect it and when you least can deal with it. I feel there is so much great food out there. There is nothing that I lack. I honestly think this is the best time to be gluten free. AL: But there are people who really have trouble with the diet, which can breed some negativity. JPL: Absolutely. That’s why I write about those feelings. And I put them out there. It’s okay to share that negativity. If someone in your family circle or circle of friends says they have heard enough from you about this, my advice is to find the next person and talk to them about it, until you don’t have to talk about it anymore. AL: How has humor helped you manage being gluten free? JPL: There are many things about the gluten-free diet and the serious conditions associated with celiac disease that are decidedly not funny. I have had my share of gloom and doom, especially at the beginning when I thought I would never recover or eat a good meal again. But I have always seen the absurdity in life. I honestly believe finding the humor in a situation is the best defense against negativity and the sense that we are living with less than most people. Humor, for me, is a way of resisting the attachment to illness or difficulty and the inevitable disappointments on a restricted diet. It is said that laughter is the best medicine. I find this to be true. When Against the Grain was first published, the letters that moved me the most were from readers who told me they laughed for the first time. I know of no study that proves complainers do any better than those who can make a joke about their situation. I would go so far as to say I attribute my good health in part to the ability to find the humor in situations I can control or change. Amy Leger, Gluten-Free Living’s family editor, also frequently does Q&A interviews for the magazine.